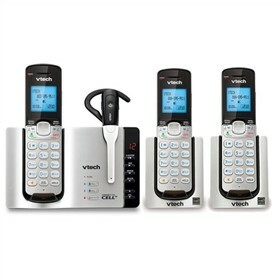 The VTech DS6671-3 + (1) DS6071 is a cordless phone with cordless headset, has Connect to Cell™ feature, which allows you to connect to bluetooth enabled cell phones to make and receive cellular calls on the home phone system. Just by placing the cell phone in an area with strong reception at home and using the Connect to Cell™ feature, you can eliminate the worry of signal dead spots. The phone has a digital answering system with up to 14 minutes of recording time. It is expandable up to 12 devices (cordless handsets or pendants) with only one phone jack. The DS6671-3 + (1) DS6071 can store 2000 records from up to 2 different cell phones, so you do not have to input names and numbers into the phone system.The phone features intercom between handsets and headset, and offers conference between an outside line and up to 4 cordless handsets. Additional features include caller id, call waiting, redial, full duplex handset speakerphone and trilingual prompts. HD Audio: The frequency band has been extended allowing for the signal to be reproduced and tuned for a fuller and clearer sound. The VTech DS6671-4 has many exciting features for users of all types. See the VTech DS6671-4 gallery images above for more product views. The VTech DS6671-4 is sold as a Brand New Unopened Item.